Whether you're using it for business or pleasure, the Gladiator can handle many types of jobs. 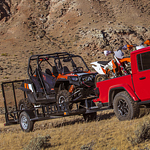 It has best-in-class payload and towing so there's no need to be shy about filling up the bed or connecting a trailer. The 4x4 system can kick in when the weather takes a turn, and you'll have the option to choose from either 4x4 high or low. Inside the truck, you and your passengers can ride comfortably. Leather seating is optional, and the entertainment system has smartphone connectivity so that your favorite songs can play over the speakers. An industry-exclusive wireless Bluetooth speaker is even available for when you want to keep the tunes going.